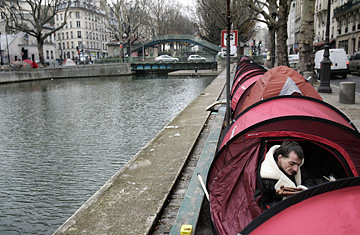 Frederic Druart,a Belgian homeless for six years, steps out of a tent set up along the Canal Saint Martin in Paris. The three letters are visible everywhere along the Saint-Martin canal in northeast Paris. They're on makeshift traffic signs warning "Attention, SDF." They're on sheets of paper tacked to trees, titled "SDF Manifesto." But most of all, they're inked on the sides of some 250 lightweight tents planted along the canal's frigid banks, alerting passersby, "An SDF Lives Here." SDF stands for sans domicile fixe and refers to the nation's estimated 86,000 homeless people. Though usually scattered around the city and hidden from view under bridges, in Metro stations or in parks, nearly 300 Parisian SDF's have grabbed the nation's attention since mid-December by camping out around the Saint-Martin canal. "I don't know what it will change in the end, but there sure are lots of people coming up here to have a look," says a 54-year-old homeless man who identifies himself only as G�rard as he pulls blankets, trash bags of clothes and even a Razor scooter from his tent while tidying up. Passing motorists slow down to gaze upon G�rard and his fellow campers; foreign tourists and vacationing French people stroll by, some taking photos and others stopping to converse with the homeless protestors. "Usually people avoid us  change to the side of the street so we don't cross paths," says G�rard. "So I guess it's a nice change in attitude, though it will probably only last as long as all this does." "All this" began on Dec. 16, when an association known as the Children of Don Quixote set up around 100 tents for the homeless alongside the canal. The organization then called on more affluent Parisians to come spend time  or even an entire, freezing night  at the camp to feel what the poor experience. Brothers Jean-Baptiste and August Legrand founded Children of Don Quixote, and laid out nearly $4,000 in personal savings to dramatize the situation of the homeless during a French pre-electoral season in which poverty seems conspicuously absent from the political debate. Since then, additional homeless people have flocked to the site to take up residence in tents provided by other nonprofit organizations. The canal-side site was chosen, explains Jean-Baptiste Legrand, because "it's one of the few places where authorities couldn't send the police in to break it up without chasing the homeless into the water." The protest has been more effective than the Legrands had imagined. Sustained media coverage has lured interested visitors and sympathizers to the canal, turning up the heat on politicians. Conservative presidential hopeful Nicolas Sarkozy was the first to respond, issuing a vague campaign promise to virtually eradicate homelessness  a socially ambitious position for an otherwise militantly free-market candidate. Initially reticent to respond to what it snubbed as a grandstanding manipulation of unfortunates, France's conservative government returned from its Christmas break with promises to increase and improve shelter capacity for the homeless. Under personal orders of President Jacques Chirac, the government then promised to add $92 million in immediate funding to the $1.4 billion it spends annually on the most needy. Supporters of the homeless  officially estimated to number 85,000 in a nation of 60 million, although some put the number closer to 150,000  say that isn't enough, and vow to remain in their canal encampment until they have shaped public opinion in support of long-term remedial action. Temporary shelters and emergency aid, they argue, are but a temporary solution that will eventually leave the homeless back on the streets. Instead, experts say state funding would be better spent creating or requisitioning subsidized housing for the homeless, offering a base of stability from which they can reintegrate into society. Successful case histories have shown, those experts note, that homeless people require a minimum of two years from leaving the streets to the time they have serious hopes of landing a stable job  for which a fixed address is always a requirement. Back along the canal Saint-Martin, hundreds of people continue bedding down on freezing concrete and paving stones, inside thin nylon tents propped up on cardboard or wooden pallets as insulation. Along a stretch of embankment an improvised sign has renamed "SDF Boulevard," G�rard backs into and zips up his tent to prepare for what he good-naturedly anticipates will be "another night, and more people wandering by." Further upstream, in a series of more permanent homeless camps by the canal, visitors are greeted with far less cheer  and told to go "back down there if you want a show." Asked why his group seemed hostile to the homeless protest drawing so much attention to his plight, a bearded man in a heavy army coat waved his questioner brusquely away, and shook his head. "When they go, you'll go, everyone will go  right back where they came from," he replied, throwing a stick on his fire. "Us, we'll still be here. We're always here."